With just two weeks to go, it’s beginning to look a LOT like Christmas in West Hampstead. Here’s our seasonal guide to what’s going on around the neighbourhood in the next couple of weeks, including December 25th. Still need to get a Christmas tree? 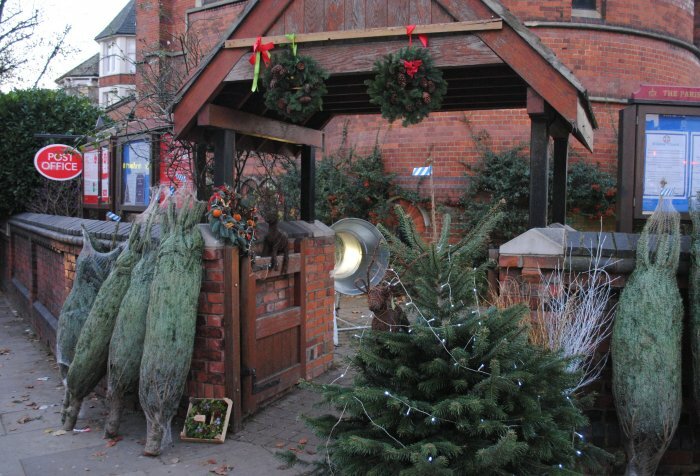 They’re on sale outside The Sherriff Centre, on the corner of Sherriff Road and West End Lane, and if you’re at the other end of town, you can find a good selection of trees at The Mill Lane Garden Centre. In other shopping news, there are many places locally to buy last-minute presents – see our gift guide for ideas. If you’re sad you missed last weekend’s Christmas Market, put a date in your diary to go to The Sherriff Centre this Saturday, December 13th – there will be several stalls selling crafts, scarves, bags, jewellery, and other ideal gifts. West Hampstead Food & Flea market is also open from 4pm-8pm Wednesday-Friday with craft stalls and edible treats. The West Hampstead Life Christmas drinks will be on December 18th – we’ll be getting some dinner from the Christmas Food & Flea market before heading to The Gallery for drinks. More details coming up soon. If you can’t imagine Christmas without a seasonal sing-song, check out our guide to local carol services and concerts. Santa is taking time out of his busy schedule to make a couple of visits to West Hampstead. He’ll be putting in an appearance at Paramount’s grotto from December 16th-18th. He’s also finding time to drop in to The Village Haberdashery on the 22nd. Both of these events are free, but please book ahead. Another fun activity for kids is The Village Haberdashery’s Christmas ornament making workshop on December 23rd. There is a materials fee of £5 per person. The Community Association for West Hampstead (CAWH) is putting on some free activities for children at West Hampstead Library. There’s a storytelling session on Saturday 13th, a Christmas decoration making workshop on Friday 19th, and a gift-wrapping session on Saturday 20th. Check the calendar on CAWH’s website for details and times. There’s no panto on in the area, but The Tricycle as usual has a family show, which this year is Lionboy. There’s more seasonal family entertainment at JW3 as part of their Chanukah programme, with Lemony Snicket’s The Latke Who Couldn’t Stop Screaming. As for Christmas Day itself, is anywhere going to be open? There will of course be church services: St James’ and St Mary’s are both holding a Midnight Mass as well as services on the 25th. Emmanuel Church also has a guide to its Christmas services online. St Luke’s, on the Fortune Green side of West Hampstead, is holding a Midnight Communion from 11pm on Christmas Eve, and an 11am Christmas Day service for all the family. What are the eating out options? 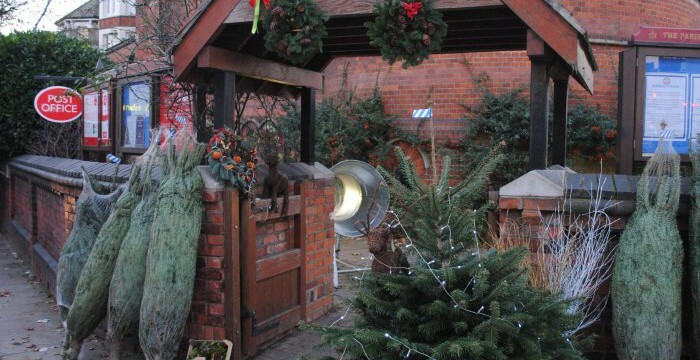 Mill Lane Bistro and The Alice House are both open with special Christmas menus. Guglee and Toomai will also be open from 4pm to 10.30pm for dine-in, home delivery and collection. The Christmas Day drinking scene is going to be pretty quiet I’m afraid – The Alliance, The Black Lion, The Gallery and La Brocca are all closed, so The Alice House looks like your only option. Onto more prosaic, but just as essential things. Rubbish collections will be rescheduled if your normal collection day is Thursday or Friday – see Camden’s revised schedule here. What about parking? Camden has confirmed that bank holiday enforcement will apply on the 25th and 26th – here’s a reminder of the parking restrictions that do not apply on public holidays. The main supermarkets – Tesco, Sainsbury’s and Waitrose – are all closed on Christmas Day, and both Waitrose branches (West End Lane and Finchley Road) are also closed on Boxing Day. If you need an emergency item on the 25th, Nisa Local (on the corner of West End Lane and Broadhurst Gardens) will be open, as will Western Food & Wine opposite. Neither of these convenience stores stock whole turkeys though. If it’s a pharmacy you need, the Christmas opening times rota for the area has not been fixed yet. Contact details for local pharmacies can be found here. Local GP practices are closed on the 25th and 26th, but if you need urgent medical help you can dial the NHS 111 service, or of course 999 in an emergency. If you need to travel during the festive period, be aware that tube and train services tend to wind down earlier than normal on Christmas Eve. There is no public transport on Christmas Day, and there will be a limited service and engineering works to contend with during the rest of the period – see here for TfL’s festive travel updates from December 21st to January 4th. Thameslink services will also not run on the 25th or 26th, and engineering works will affect services between December 27th and January 2nd. Property News: Protect those pipes this winter What have I missed since December 8th?